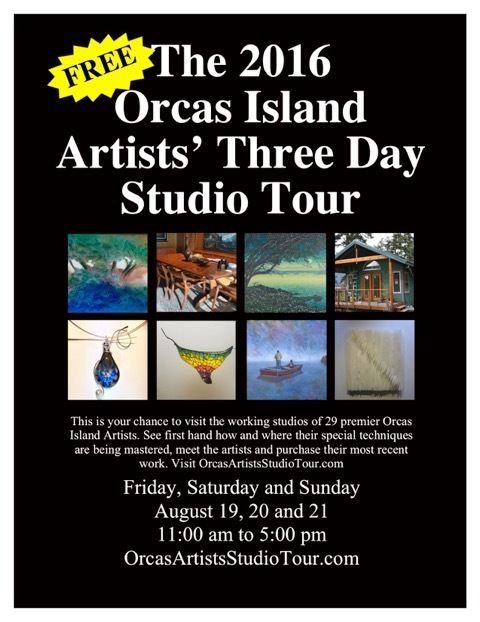 Visit Studio #5 of this weekend’s Studio Tour for a multi-disciplinary creative experience. In a Geer Lane studio, perched on a hill just outside Eastsound, Rosemarie Altberg creates etchings, drawings and watercolors. She is also a turner of wooden bowls, boxes and rings, and a maker of integrated metal and wood jewelry. Her wearable art centers on copper and silver pendant necklaces that look like tiny sculptural collages. On Friday and Saturday, Rosemarie will do a turning demonstration. Her friend, the artist Sue Lam, will help with a watercolor demonstration on Saturday. Born in Bremen, Germany, Rosemarie is a broadly accomplished artist who holds a BA in Art Education from American University in Washington DC, and a MA in Printmaking and Drawing from Northern Illinois University. Her teaching career include stints in Alexandria, Chicago and San Francisco Bay Areas. Come see what Rosemarie will make this weekend!